I’m not saying that what you’re about to read has triggered a constitutional crisis, but what you’re about to read has triggered a constitutional crisis. The waiters know well Trump’s personal preferences. As he settles down, they bring him a Diet Coke, while the rest of us are served water, with the Vice President sitting at one end of the table. With the salad course, Trump is served what appears to be Thousand Island dressing instead of the creamy vinaigrette for his guests. When the chicken arrives, he is the only one given an extra dish of sauce. 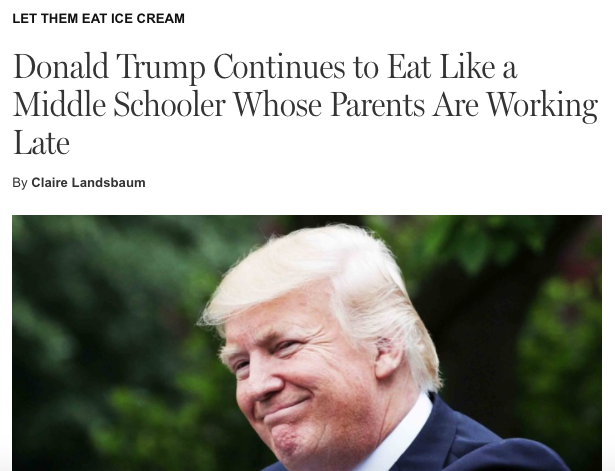 At the dessert course, he gets two scoops of vanilla ice cream with his chocolate cream pie, instead of the single scoop for everyone else. Move over, Woodward and Bernstein. When everything is Watergate, nothing is.